Susan sold a sweet German wine to Shelly DeCrane, a friend of Susan's mom, as her first sale the day before Market Alley Wines officially opened. The moment she sold the bottle, she wanted to tell someone to pinch her because she could not believe it was actually happening. She was so terrified the first day that no one would come to the store that she could not sleep at night. Every single sale that day was a success for Susan and she remembered crouching behind the counter and saying "yes!" after the customers left. 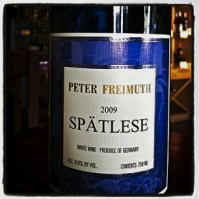 Peter Freimuth's Spatlese is a type of riesling from the Mosel wine region in Germany. It is often paired with pork, fish, spicy food, or sweet desserts. It displays pear and apple flavors and aromas. Market Alley Wines' best seller is Serena, a sweet red wine that has accents of rhubarb-strawberry wine. Since opening Market Alley Wines, Susan has sold thousands of bottles of Serena. This is the type of wine Susan sold to Shelly DeCrane. It is often paired with desserts, similar to the Serena wine popularly sold at Market Alley Wines. Serena is Market Alley Wines' best seller. The wine is best paired with dessert, especially those with fruit.